Castleford Tigers Women bagged a league victory over York City Knights on the eve of their Challenge Cup semi-final meeting this week. Courtney Pointon made the headlines having scored a hat-trick on her Women’s Super League debut while Alex Wallace also scored a brace as the Tigresses ran out 40-10 winners to tighten their place on the top four. It took only three minutes for Pointon to get on the scoresheet. Castleford shifted the ball out wide where centre Wallace found the young winger who touched down to give the hosts a perfect start. Things quickly got better for Cas as Maisie Burton burst through York’s defence to make it 8-0. However, it was at this point where York stopped leaking tries and began to test the resilience of Castleford’s defence. Pressure from the visitors caused Castleford to concede a penalty deep in their own half. York soon reaped the rewards as Ellena Powell crossed the whitewash. A conversion from Ellie Hendry took Super League’s bottom team within two points of the Tigresses. This took some steam out of Castleford’s engine and it took the team a quarter of an hour before they could extend their lead. A first try for Wallace and a second for Pointon made it 18-6 before Lucy Eastwood’s effort enhanced the hosts’ position. Ten minutes into the second half, Pointon burst down the wing and celebrated her debut hat-trick. Her effort was converted by Katie Hepworth, which made the scores 30-6. Only a few minutes later, Wallace crossed for her second try, although celebrations did not last long as York quickly hit back through Ashleigh Hyde. With only a few minutes remaining, a York comeback was out of the question. However, this did not mean that the visitors were going to stop trying. In fact, York created a number of opportunities towards the end of the game, but simply lacked the cutting edge to turn those chances into points. Castleford held out well and closed the game out with a try from Jasmine Rowley, which made the full time score 40-10. 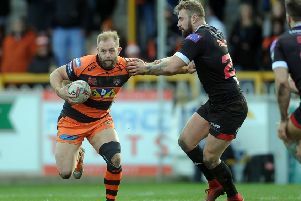 Despite the victory, Castleford were disappointed with their performance. Earlier in the season the Tigresses put over 60 points past the Knights, but an improved York outfit plus a youthful team selection from Castleford made this a more competitive fixture. Next week the two sides meet again in a highly anticipated Challenge Cup semi-final clash and with a first appearance in the final at stake the Tigresses will be motivated. The game will take place at the Mend-A-Hose Jungle and is currently scheduled for a 1pm kick-off.